Every year at this time, I go through the some past posts that have relevance to the season. There are so many fun things to do for Thanksgiving and the Autumn season, that I have not run out of ideas yet. But, new readers may not have seen these ideas from past years, so here is a round up of some ideas. First up, in 2014 I told a bunch of Thanksgiving stories from years gone by in Thanksgiving 101. I love reading your stories too! 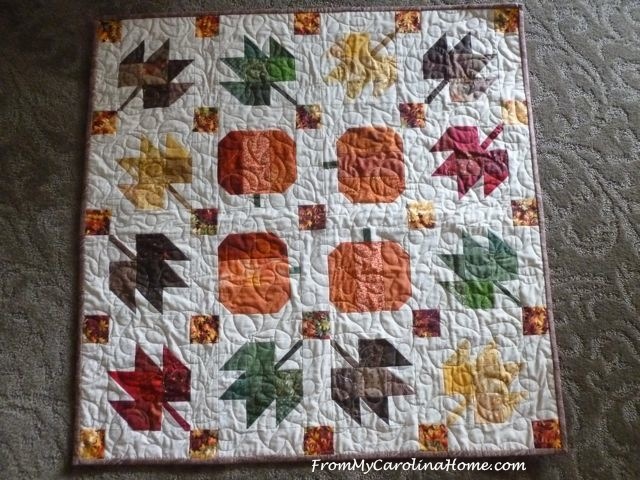 From the first Autumn Jubilee, a Pumpkin and Leaf Table Topper with links to the unit patterns and more ways to put it together. From 2015, How To Brine and Bake a Moist Succulent Turkey, and it doesn’t take as much as you think. I show you how to make room in the frig for it too. Need a different pumpkin dessert for the big day? 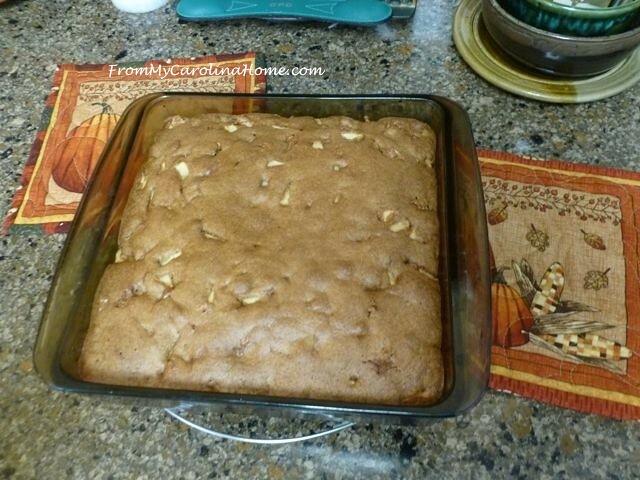 Try my Pumpkin Toffee Dump Cake. 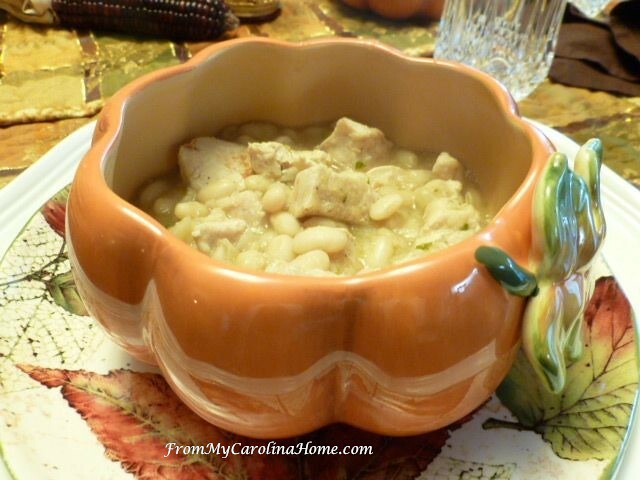 How about some Chicken Chili for a filling meal on a cold day? Or a Caramel Apple Coffee Cake for breakfast? Then, make sure your home is guest ready with Getting Really Ready for Company. There are so many things to think about, and you might be surprised at what you find in your own home when you do one simple thing. 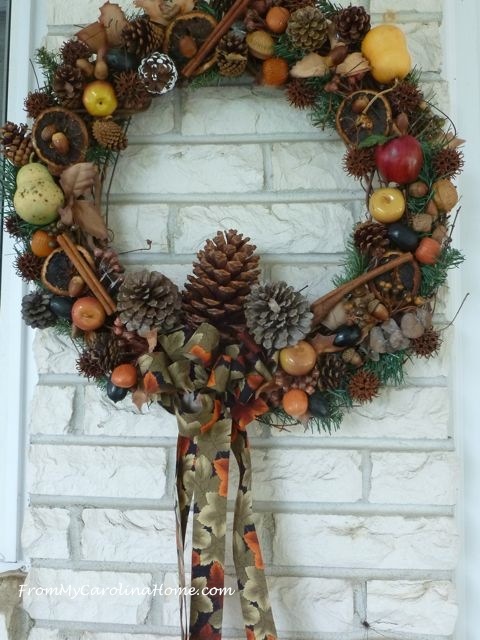 Make a holiday wreath for the front door, with this pine cone design – Harvest Wreaths – plus another wreath idea in that post. 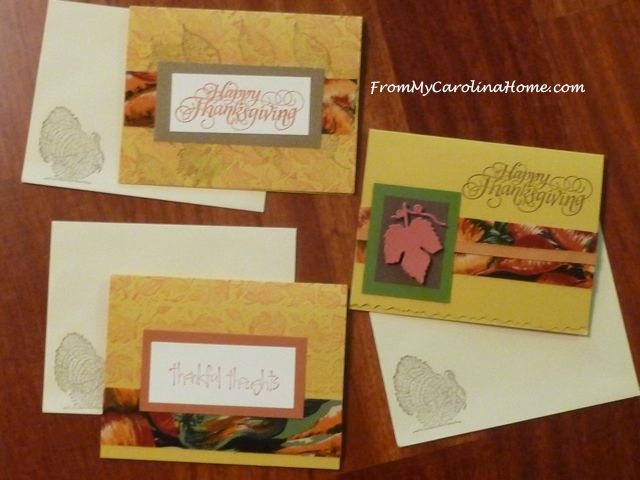 Stamp some Thanksgiving cards for your family. But most of all, hug your loved ones and enjoy the laughter of the everyday. Cherish the small moments, rejoice in being with your family and friends. It is a season of gratitude, which I often mention, like this post – Itadakimasu and Musings on Gratitude. If you were not a reader last February, I hope you will read that post on living in the world and in the moment. Thanksgiving is my favorite day of the year, a whole day of gratitude and I am looking forward to it next week. Yikes, it is next week!! Are you ready? 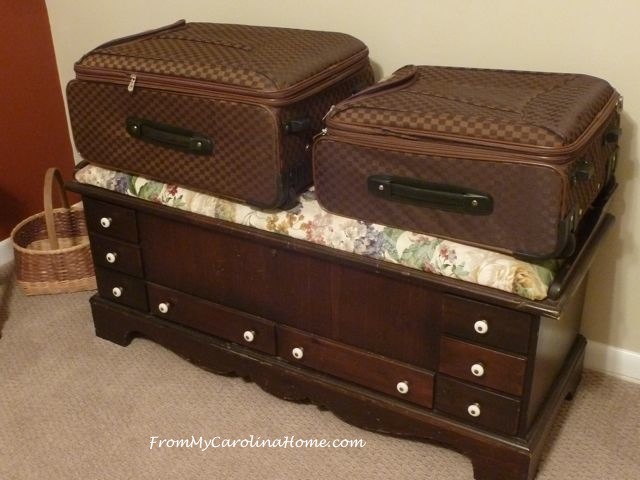 Great post, liked the guest room suggestions. We don’t do a big Thanksgiving meal. Our daughter and her family go to my SIL’s family’s for lunch. But a few years ago, we started a fun new tradition. Thanksgiving night, the grands come to our house while the parents go shopping and we dig out the Little Red Campfire and have a wiener roast and make S’mores! They love it! And we enjoy our time with them!! Thank YOU for all you do Carole. 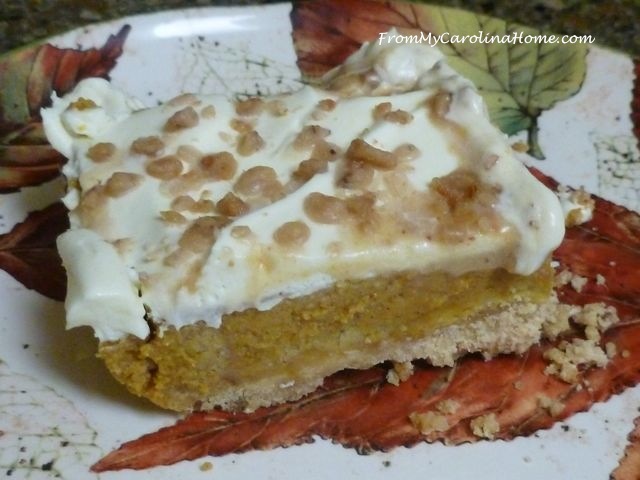 That Toffee Pumpkin Cake looks delicious! Love all the suggestions along with the guest room ideas. Yesterday I did the bulk of the grocery shopping for the Thanksgiving holidays. So I am happy to check that off the list before the stores are even more crowded! Today I am going to pull out some decorations to make the house festive. I know, I know…. I said that to you yesterday. But today it is!!! Amazing and wonderful. These are great ideas. 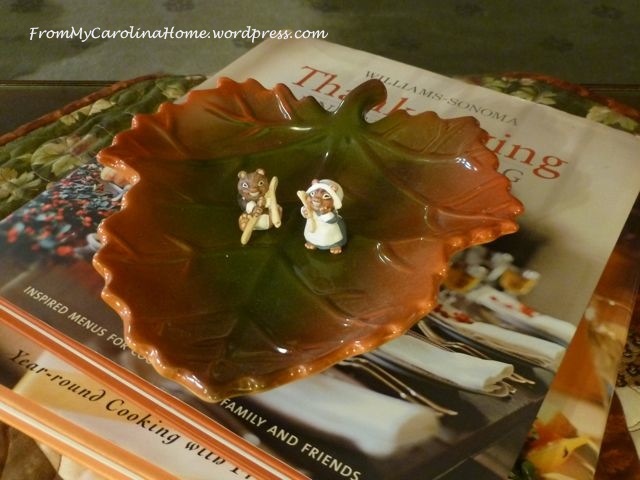 The leaf pattern was exactly what I was needing for my table topper, you saved me some time, Carole! Loved your post on getting ready for company, :), great ideas there too. In fact this is just one giant batch of great ideas! Thanksgiving will be just my husband and I, so it will be quiet without a lot of fuss. I have a turkey breast and will make the usual sides including homemade cranberry sauce and pumpkin pie. I may even do a bit of quilting. Hope you have a wonderful Thanksgiving filled with gratitude. I can’t believe we are a week from Thanksgiving! Where has this year flown? Great ideas here, Carole! I don’t host Thanksgiving but I do help out with the cooking, so I’ll be concentrating on that. I’m never ready, but it comes, it happens, and it leaves good memories behind anyway. =) Thanks for the reminder of those posts, particularly the pumpkin toffee dump cake! Thanks. I went back and read your getting ready for company post and found a lot in there of interest. Great ideas. 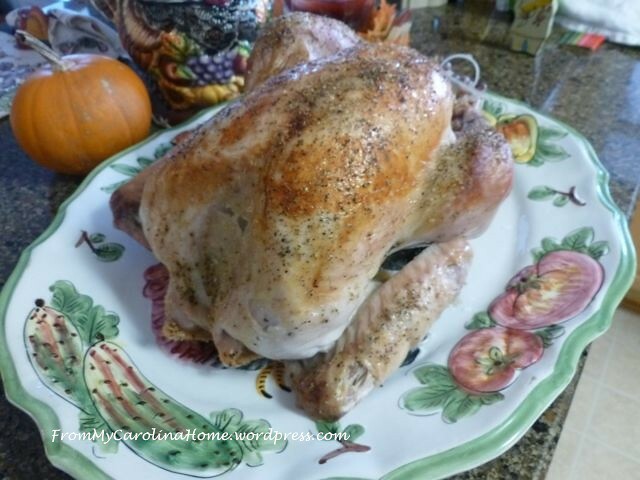 If you didn’t try Carole’s turkey brining instructions, I encourage you to check out the link above in her post. I brined my first turkey and it turned out so tender and juicy. Will probably always use this method. Best turkey ever!! !